Home » All News » The Mafia in Italian Lives and Literature: Life Sentences and Their Geographies. The Mafia in Italian Lives and Literature: Life Sentences and Their Geographies. Prof. Robin Pickering-Iazzi’s new book has just been released! “Using an array of cultural documents from 1990 to the present, including diaries, testimonies, fiction, online video postings, and anti-mafia social networks, Robin Pickering-Iazzi examines the myths, values, codes of behaviour, and relationships produced by the Italian mafia through a wide cross-disciplinary lens. 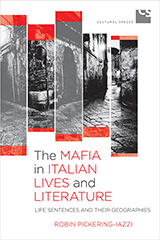 The Mafia in Italian Lives and Literature explores the ways that these literary engagements with the mafia relate to broader contemporary Italian life and offer implicit challenges, and a quiet code of resistance, to the trauma and injustice wrought by the mafia in various Italian cities.